One of the many reasons America is the greatest country on Earth and European nations are not is that Americans don't have to eat horsemeat lasagna. One of the many reasons America is the greatest country on Earth and European nations are not is that Americans don’t have to eat horsemeat lasagna. 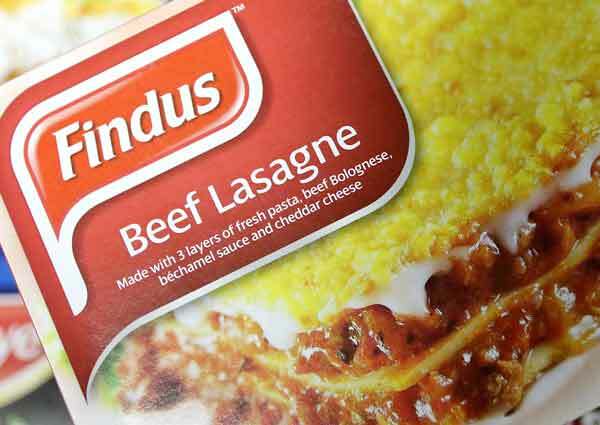 No, our frozen lasagna generally contains beef, which differs from horsemeat in many ways, such as horsemeat is said to be sweeter than beef, and usually leaner, too, meaning it has about half the calories. On the other hand, Mr. Ed and Seabiscuit were not beef cattle, if you get my drift. Europe has been aghast and agog since horse DNA was found last month in some frozen beef samples in Ireland. The problems then got baked into lasagna and spread to England and 14 other nations. Health ministers met in Brussels on Thursday amid talk of a criminal conspiracy. At first fingers were pointed at France, where horsemeat is known as viande de cheval and considered quite tasty. But now slaughterhouses in many countries are being raided. Officially the concern is about mislabeling, but the cultural objections are huge. I don’t get it, but then again, I’ve had horses bite me and kick me, so maybe I’m not the guy to ask. I will say I was upset when I learned that Ferdinand, the winner of the 1986 Kentucky Derby, had been destroyed in Japan in 2002 and is believed to have wound up in pet food. I was at Churchill Downs for that Derby and had $20 on Ferdinand’s nose. The colt went off at 17-to-1 but 54-year-old Bill Shoemaker was aboard and I figured what the hell, I’m a lousy handicapper anyway, so go with the old guy. Call me an animal rights nut, but a horse that returns $375 on a $20 bet shouldn’t be eaten by man or beast. Making things worse is that Great Britain is where the modern animal rights movement first gained traction with the 1975 publication of “Animal Liberation” by the Australian philosopher Peter Singer. By 1980, a British-born stockbroker named Ingrid Newkirk had read Singer’s book and founded People for the Ethical Treatment of Animals in Virginia and we were off to the races. Not literally, of course, because animals shouldn’t be forced to race for people’s entertainment, even if they come home at 17-to-1. Plus, as The New York Times revealed last year, an average of 24 horses a week die at American racetracks, shot up with drugs to help them overcome injuries and pain. This is why you should never eat racehorse meat, even if you’re in France and the steak a cheval looks enticing. Let’s face it, eating horsemeat is a cultural thing. At a moral level, it’s no better or worse than eating beef, chicken, hogs or any other animal raised for food. It might be worse than eating, say, venison, because the horse has come to trust you and deer are notoriously paranoid. The same for eating dogs. In Western cultures, people no longer eat dogs because (a) we’ve come to assume that that’s not what they’re for and (b) we hardly ever get hungry enough. There’s a scene in the movie version of Elmore Leonard’s 1961 western novel “Hombre” where the hero (Paul Newman at his finest) is talking to the snooty wife of an Indian agent. Newman’s character, John Russell, is a white man who was raised by Apaches. “I can’t imagine eating a dog and not thinking anything of it,” she says. We in the West live in the best of times and, for food anyway, the best of places. In the United States, with 5 percent of the world’s population, we consume a sixth of the world’s animal protein, eight ounces per person per day, and pay less for it than people anywhere else in the world. We waste more animal protein than many of the world’s nations ever see. As other nations grow more affluent, they want to like what we do. Meat consumption worldwide is growing, but it’s dropped 12 percent over the last five years in the United States. Part of that is because people are choosing to eat less meat for health reasons. Much of it is because economic times have been tough and meat is more expensive because of climate change and world demand. There are 925 million hungry people in the world, and we spend $51 billion a year on our pets. We can afford to be appalled at horsemeat lasagna and dog stew. It’s a nice luxury. Kevin Horrigan is a columnist for the St. Louis Post-Dispatch. Email him at [email protected] This column was distributed by MCT Information Services.